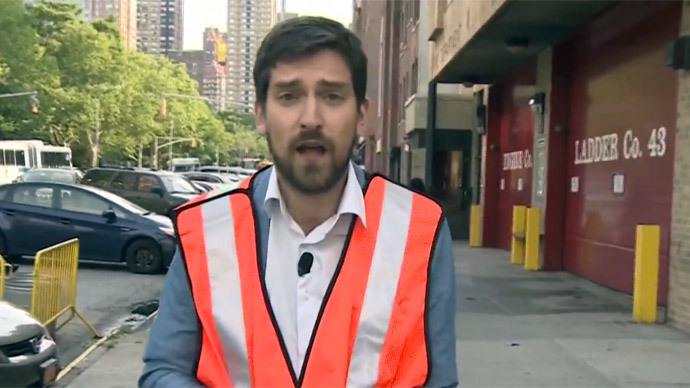 The New York Housing Authority is so worried about their workers being targeted by the police that they want them to wear bright orange vests. They say it will make them more visible, but others say it’s to stop them being shot by “trigger-happy” cops. The move comes after a law enforcement officer fatally shot a maintenance crew worker, who was going about his everyday job. The man, father of two Akai Gurley, was unarmed and was in a poorly lit stairwell of a Brooklyn housing complex when he accidentally startled police officer Peter Liang, who opened fire by mistake. “[The elevator workers] were basically told the reason was because of recent incidents where cops had pulled a gun on a caretaker and a supervisor on the roof of a housing project,” a source told the New York Post. However, RT America’s Aleksey Yaroshevsky was given a different version by the New York City Housing Authority (NYCHA). He was told that the move was part of the Safety in Motion initiative and was not related to any incidents involving the city’s cops. He also said workers will be required to wear their official identification around their necks so workers don't need to reach into their back pockets for identification. This has not gone down well with all the employees who like to keep their IDs out of public view, so that drug dealers and gang members do not know their names. The safety drive was announced in late May and could affect over 10,000 workers who help to maintain around 2,500 buildings in the city. New York is the largest public housing authority in the US and provides homes for over 600,000 residents. Gregory Floyd, who is the president of a union which represents 8,000 Housing Authority workers, a third of whom are also NYCHA residents, said poorly lit areas in housing complexes are a problem. However, requests to add extra lighting is often ignored at both a local and federal level. Melissa Mark-Viverito, the speaker of the New York City Council, also slammed the lack of money invested, saying more needed to be done to make residents feel secure. “For too long, NYCHA has contended with severe disillusionment, disinvestment, and disrepair. New Yorkers in public housing deserve to feel safe in their homes, and these essential security upgrades will go a long way toward ensuring safer communities and peace of mind for thousands of NYCHA residents,” she said in a NYCHA press release. Over the last two decades, the NYCHA has seen its funding plummet, which has caused it to lose over $2.1 billion. With a lack of support at federal and state level, the City Council has agreed to fund a small part of the NYCHA’s needs, providing it with $17 million for 2015, which will help to install closed-circuit-television and other security features, the press release added.